The thin air makes every upward centimetre a struggle against gravity. The cold gnaws into the core of your bones. To put it another way, the competition is fierce as more and more cars struggle to be near the epicentre of the best European motoring has offered. So many vehicles and only one can be number three. That position belongs to the Wartburg 312. History is written by the winners. That means those car companies that fall by the wayside get forgotten, no matter their contribution to motoring history: Alvis, Wolseley, Matra, Borgward and Talbot, Simca, Panhard to name but six. Wartburg produced the 311 from 1956 to 1965. It came in a variety of formats, all produced at the factory in Eisenach, Germany: saloon, roadster, coupe and pickup. Wartburg’s engineers developed the car from AutoUnion, adding some length to the chassis and ends to make a spacious and comfortable car, well-suited to its target market. Had history not intervened, this car might have been more common in W. Europe than it was. These days we see two-stroke engines as something of an oddity but Saab, DKW, VEB and Suzuki offered this format. Its advantages include a high power to weight ration and having fewer parts. While increasingly stringent emmissions standards killed the format off in the 1980s, in an alternative future electronics and catalytic conversion might have allowed further development but these did not emerge in time to save the concept. The Wartburg 311 has a body-on-frame chassis and this, coupled with its suspension design of transverse leaf springs meant it was very comfortable. Having seen one move over the cobbled streets of eastern Germany, I can say the vehicle veritably glides much in the manner of a Citroen. The elegant, Americanesque styling is attributed to Hans Fleischer. Born in Eisenach and trained at BMW, he produced a car with a distinctive form and a commodious and well-appointed interior. Where would Wartburg be today if they had not been suffocated by the inefficiencies of communism and the sudden introduction of the market economy in the 1990s? Based on the character of the 311, Wartburg could have been a purveyor of comfortable, mid-price cars. Alas, that space is intensely fought over: Ford, Opel, Renault, Citroen and many others. Alternatively, based on the form of the succeeding car, the 353, Wartburg could have offered some form of uncompromising modernism. I like to think the 311 and a similarly smooth-riding 353 might have tipped the balance of car handling a little more towards comfort than it is at present along with another approach to engine design: an electronically managed, catalysed high-output two-stroke driving a light and spacious shell. The leaf-spring concept is not entirely dead either. You can find a nice introduction to the concept here. Cars like this remind one that there are other formulae for adapting to the motoring environment. While typically, sports cars get the most prominence as landmarks, they are sold in small numbers compared to practical, all-around transport like the 311. I do like the way this is going, Richard . . . Two-strokes could also make do with a gearbox with no reverse. All you had to do was switch off and then restart with the engine rotating in the opposite direction, thus providing the same number of gears whichever direction the vehicle was travelling in. The only example of such a machine I have ever owned was a Messerschmitt KR200 – theoretically capable of 60 mph backwards. I tried it one day, changed up into 2nd and promptly lost my nerve. Fleischer’s time at BMW shows. This car resembles a 503 in general ambience, and the rear in particular. The most obvious early success for the front transverse leaf spring was of course the Flavia. A very pleasant looking car, more stylish and contemporary, at least at its launch in 1956, than its rigorously utilitarian successor was eleven years later. I wonder how much Communist philosophy and ideals dictated the look of the 353, which was resolutely serious and lacked any frivolous ornsmentation. Maybe I’m reading rather too much into this? Regarding leaf springs, doesn’t Volvo use transverse composite leaf springs on its XC, V and S90 models? Communist philosophy probably didn´t pay too much attention to aesthetics. I think the designers were probably free to do as they wish and chose utilitarian style for the car. That did however chime with the practically-oriented outlook of communism. That practicality didn´t apply to reliability, of course. If the free-market forgets the community, communism forgets the individual. ….Yes, Volvo are still using leaf-springs. I like that. It´s not something one hears so much about since almost everything uses either MacPhersons or some form of multi-link set-up. If I had a car company I´d ban those. That’s a rather sweeping statement Richard. While the good old leaf spring has received a lot of bad press over the years, there is not a lot wrong theoretically with a McPherson strut, or a five-link rear suspension. Horses for courses I would say. The important thing is that any suspension medium is used appropriately, designed with some intelligence – and preferably, a quantum of compliance. It’s my hypothetical firm, Eoin. That said, yes, you are right that the choice of suspension is not about dogma but finding the best one for the job. My definition of “best” is related to character and idiosyncracy. Developing a theme from an earlier discussion I will add rack and pinion steering to my spec along with a five speed gearbox, rotary HVAC controls, a four-cylinder boxer engine and all-wheel drive. Passive rear-steering too. I want a car with some interesting quirks and would be intrigued to see what the chassis development engineers would be able to make of it. I think that any handling inadequacies might make for a more interesting car. Bill: can a leaf spring be tamed without adding complexity? If it is to retain its dual role, I mean. Richard – is it the 311 or 312 which has achieved this heady – and well-deserved – accolade? You mention both. The difference is straightforward – Coil springs took the place of transverse leaves with the arrival of the 1965 312, a short-lived interim model, in essence a 311 body on 353 mechanicals. It lived on until 1967, when the 353 body line finally came on stream in the cramped little factory in the centre of Eisenach. Here’s a picture of the coil-sprung chassis which, didn’t even change much when the 353 went transverse-engined and front wheel drive, thirty years ago this year. Of course, everything had to be a compromise for the cash-strapped Thuringians. The 353 was a good and enduring effort, but it’s a shadow of the planned 1959-61 P100, with far more elegant bodywork and a four stroke flat four under the back seat. I think I mean the 311. Why is DTW the one place where you´d find someone who knew the difference between the two cars? Why?? Lovely set of pictures, Robert. Your personal archives would seem to handily outdo most long-standing commercial magazines! Just amazing. The wall-mounted chassis you show intrigues me. The absence of a propeller shaft would seem to imply the car had front wheel drive, and the silencer is somewhat in the way of where it would have to go. Yet the engine appears to be longitudinally mounted. Is this an Audiesque/DKW “copy” for FWD? Two stroke engines of that era by their basic nature tend to have lower combustion temperatures due to residual unburnt mixture mixing with the incoming intake charge, and that lowers NOx output all by itself, but also reduces cylinder pressure and torque output. Sort of built-in exhaust gas recirculation EGR. Unfortunately excess unburnt hydrocarbons are what exits the cylinder compared to four-strokes and today, these would have to be cleaned up. Add in some burnt oil from piston ring scrapings exiting the exhaust ports, and one sees that some sort of exhaust valve mechanism is really required, which affects complexity and cost. When it comes to leaf springs and independent suspension, one has to discriminate between past inexpensive (cheapo) designs where the leaf doubles as a wishbone, and modern Corvettes and Volvos where its use is only as a spring and chosen for packaging or structural reasons. 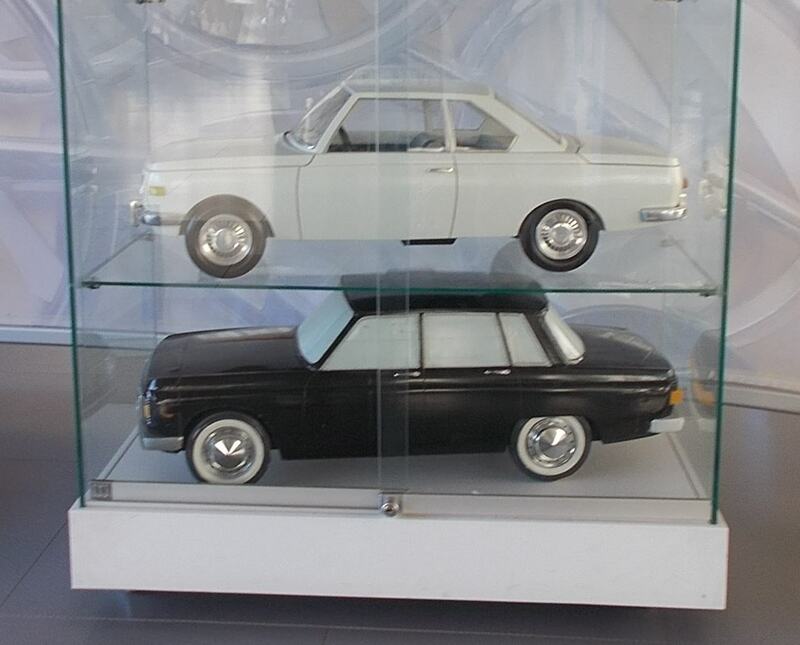 That P100 is a pretty little car. Thanks for posting that. The Wartburg drivetrain is in parallel with DKWs from the F91 on and is still found in today’s Audis. Engineers in the GDR had a run in two stroke technology, best shown in Walter Kaaden’s work at MZ. Kaaden was the first engine designer who understood the two stroke as a continuous flow machine with modulated disturbance impulses, a step that found seemingly endless power in these engines. Transverse leaf springs can be used very efficiently. Multi layered springs have high internal friction, lessening the stress on shock absorbers. When used (as pioneered by Fiat) with two mounting points cornering loads are countered without the need anti roll bars. This ability was essential to the Fiat 128’s excellent (for the time) road holding. 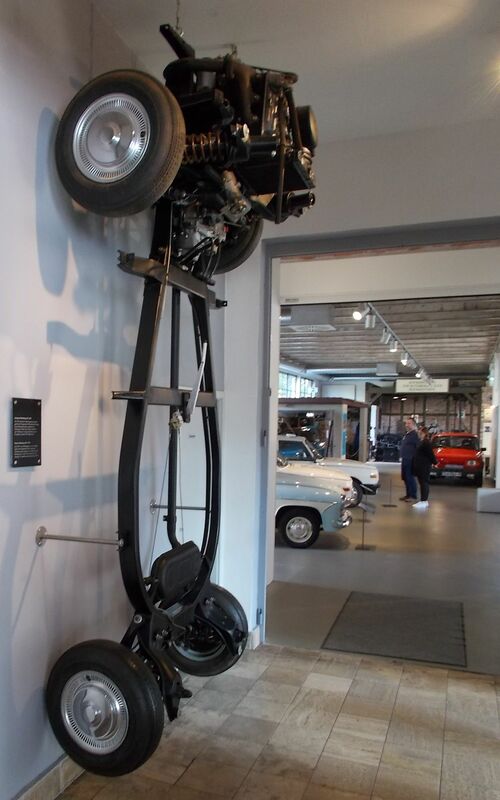 The rear suspension the 311 inherited from DKW was unique in its geometry. The mounting point of the transverse leaf spring was in height of the centre of gravity, thereby eliminating body roll under cornering at that axle. This ‘hovering axle’ (Schwebeachse) already gave DKWs very good road manners and made them astonishingly fast. Multi link suspensions are the default solution for keeping a modern tyre perpendicular to the road surface at all times in order to avoid changes in the size of its contact patch that would be detrimental to the road behaviour of the car. The 311 is the east German car I’d most like to own. Having seen one on the move and heard its quiet engine I was really impressed. A bit of speed adds to the attraction. Thanks for the technical detail.